Apologetics Press - Is the Gap Theory Linguistically Viable? At the center of scientific inquiry is a desire to express free thought. “Go wherever your mind leads you” is the academic cry that hearkens back at least to the Enlightenment. For Bible believers, however, this mantra has its limits. If one’s pursuit of so-called “knowledge” leads him to deny the divinity of Christ or the existence of God, then he has become a victim of intellectual deceit. The philosophical constructs causing him to reach these conclusions must be reexamined if not rejected. Such is the case with many modern theories of universal origins. By eliminating God as the primal Cause, these theories operate under false pretenses, and thus can never reach the truth. Many Christians working in the field of scientific cosmology seek to poach godless theories from modern science and work them into a model of biblical faith. We should applaud their efforts so long as they do not “go beyond what is written” (1 Corinthians 4:6). Unfortunately, some do go too far. In their desire to harmonize the biblical account with the scientific “necessity” of old-Earth creationism, they seek to read into the Bible concepts not clearly present. Rather than using divine inspiration to inform science, they prefer to impose modern scientific insight onto the Bible—an insight, it should be observed, the original readers of the Bible would not have understood. One example of the harmonistic approach between modern “science” and biblical faith is the so-called “Gap Theory.” Although there are numerous iterations of this idea, each of them suggests Genesis 1 contains a gap or multiple gaps in which can be squeezed the amount of time necessary to accommodate an Earth billions of years old. Although the biblical text does not require or even intimate such gaps, proponents of Gap Theory insist that the science requires it. In other words, they allow the tail to wag the dog, allowing “science” to trump plain biblical teaching. Of course, for theists who claim to accept the biblical account of Creation, much is at stake. If Gap Theory is correct, then the Bible must be made to accommodate it. Since anyone with common sense and an English Bible would find it difficult to accept Gap Theory from the Genesis account alone, Gap theorists often transfer the debate to the mysterious world of Hebrew linguistics. Playing on the ignorance of the general Bible reader (and often revealing their own), Gap theorists insist the Hebrew terminology makes Gap Theory possible. So far as I know there is no professor of Hebrew or Old Testament at any world-class university who does not believe that the writer(s) [sic] of Genesis 1–11 intended to convey to their readers the ideas that (a) creation took place in a series of six days which were the same as the days of 24 hours we now experience; (b) the figures contained in the Genesis genealogies provide by simple addition a chronology from the beginning of the world up to the later stages of the Biblical story, and (c) Noah’s flood was understood to be worldwide, and to have extinguished all human and land animal life except for those in the ark (as quoted in Platinga, 2001, p. 217). These reasons explain why critical biblical scholarship tends to discuss the genre of Genesis 1-11, that is, whether it is intended to be history or mythology, whether it is literal or symbolic, whether it contains any truth or some truth. The meaning of the words themselves, however, is under no major dispute. But Gap theorists maintain the Creation account is both historical and (apparently) incomprehensible (at least, without the “expert” guidance of the Gap theorist). They insist the key to unlocking Genesis 1 is not what it does say, but what it doesn’t say. What a strange method of interpretation. There are two major linguistic arguments cited in favor of Gap Theory. First, Gap theorists begin by understanding the term bārā’ in Genesis 1 to mean “create” (from nothing), and ‘āsāh to mean “restore” (at a later time). The bārā’ creation marks the initial stage of Creation in which God set the world into motion by fiat. One of the earliest Gap theorists, George H. Pember, wrote over 100 years ago: “For we are told that in the beginning God created the heaven and the earth; but the Scriptures never affirm that He did this in the six days. The work of those days was…quite a different thing from the original creation: they were times of restoration, and the word asah [sic] is used in connection with them” (1907, pp. 22-23). Within churches of Christ, John Clayton has been an active proponent of the insights of Gap Theory, although his actual position defies precise categorization. Thompson refers to it as the “modified Gap Theory,” although Clayton himself is rather coy about labeling his position (2000, pp. 281-296). Like others, Clayton also appeals to the Hebrew language to defend his version of the theory. Unfortunately, like the Gap theorists, he too states bārā’ is a miraculous creation from nothing, even going so far as to suggest Genesis 1:1 implies the “Big Bang” (Clayton, 2015, p. 90). Like the Gap theorists, Clayton also parrots the view that ‘āsāh means “reworking existing material” (2011, p. 207). If Clayton were to read the rest of the Hebrew Bible, or even the rest of Genesis, he would learn that his definitions are impossible to maintain (as we shall demonstrate). By interpreting the Hebrew in this fashion, Gap theorists believe they can accommodate an Earth billions of years old without compromising the essential integrity of the Genesis account. The bārā’ stage of Creation occurs first (Genesis 1:1), and, after centuries or even billions of years, the ‘āsāh stage of Creation occurs (the “six days,” Genesis 1:2ff.). Unfortunately, Gap theorists focus their attention, so far as the Hebrew is concerned, principally on Genesis 1 and Exodus 20:11 (taken as proof of the ‘āsāh stage of Creation). Again, if they were to read the entire Hebrew Bible, however, they would learn their position to be linguistically untenable, as we shall demonstrate. Second, Gap theorists allege the grammar of Genesis 1:2 implies a gap. Basically, three arguments are made from the Hebrew: (1) The Hebrew waw is disjunctive, and thus implies an interruption in the narration from what is reported in Genesis 1:1. This interruption signals a chronological “gap”; (2) The verb form “was” (hāyetāh)should be translated “became,” signaling a new beginning beyond the bārā’ creation of Genesis 1:1; and (3) The nouns traditionally translated “without form and void” (tōhū vā-vōhū) imply a degeneration of the original Creation, and thus what follows is a re-creation. We shall proceed to discuss and evaluate these Hebrew linguistic arguments, beginning first with the question of bārā’ and ‘āsāh, and then turning to the grammar of Genesis 1:2 specifically. In the course of our analysis, the linguistic evidence for the Gap Theory will be shown to be lacking? The Genesis account uses no less than four terms to describe Creation. The terms best known are bārā’ (“create”) and ‘āsāh (“make”), although yātsar (“form”) and bānāh (“build”) are also found. Man is “formed” (yātsar) from the dirt (Genesis 2:7-8), and woman is “built” (bānāh) from man (Genesis 2:22). The bulk of attention, however, has centered around bārā’ and ‘āsāh, the most frequent of these four words in the Creation account. Gap theorists allege these terms refer to very different stages of Creation, billions of years apart. We shall see that, while this theory is attractive at the macro-level, the Hebrew terminology simply will not bear the burden of proof Gap theorists load upon it. We should begin by noting that the Bible uses multiple terms to describe God’s creative activity. Across the Old Testament, in Hebrew and Aramaic, one can locate no less than 13 different terms for Creation! So Israelite Creation theology is not as simple as making a facile distinction between bārā’ and ‘āsāh. In fact, these terms are used interchangeably of God’s creative activity. Notice that the first and final components (a and a’) are flipped, signaling the inverted nature of the verse, and they also highlight the verse’s synonymous parallelism (both halves convey exactly the same idea). Also note the parallelism of b and b’. The whole of the Creation narrative could be described by both Hebrew terms. So the forced distinction made by Gap theorists between bārā’ and ‘āsāh is already shown to be artificial in the Genesis account itself. But we can go further. The terms bārā’ and ‘āsāh are routinely used in parallel with one another, both in Genesis and elsewhere in the Hebrew Bible. God both “created” (bārā’) and “made” (‘āsāh) Adam (Genesis 5:1). God will destroy man whom He has “created” (bārā’), along with every living thing, for He was sorry that He had “made” (‘āsāh) them (Genesis 6:7). The hand of God “has done” (‘āsāh) it, and God Himself “created” (bārā’) it (Isaiah 41:20). God has “created” (bārā’) and “made” (‘āsāh) for His glory (Isaiah 43:7). God has “made” (‘āsāh) Earth and “created” (bārā’) man on it (Isaiah 45:12). God “made” (‘āsāh) and “created” (bārā’) the Earth (Isaiah 45:18). God “creates” (bārā’) wind and “makes” (‘āsāh) darkness (Amos 4:13). As any careful reader of the Bible will observe, the Hebrew language does not make a sharp distinction between bārā’ and ‘āsāh in accounts depicting the Creation. On the contrary, the terms are used interchangeably for Creation throughout the Old Testament, and can often be found in parallel expressions. Now, this does not mean that bārā’ and ‘āsāh are always synonymous terms. The word bārā’ occurs 53 times in the Bible, and generally has to do with an initial act, or a new beginning. For example, God “creates something new” at the punishment of Korah and his company (Numbers 16:30). He “makes a new beginning” of Israel after the Babylonian Exile (Isaiah 41:20). The term represents a change—a new beginning—in the natural order as well (Isaiah 65:15; Jeremiah 31:22). So, in addition to creation, which is always an “initial act” on God’s part, subsequent divine intervention after creation can also be depicted by the word bārā’. This explains why the term can be used of the creation of man. He was a new creature, a new beginning, in the process. If Gap theorists were correct, any usage of bārā’ after the initialGenesis Creation would be inappropriate. This clearly is not the case. The term ‘āsāh, by comparison,has a much broader semantic range. This term occurs 2,627 times, making it one of the most common verbs in the Bible. In addition to meaning “make,” ‘āsāh is the standard verb for “do, act, or perform” in Hebrew. It often means to “keep” the Law (Deuteronomy 5:32), to manufacture a product (1 Samuel 8:12), to “carve” (Ezekiel 41:18), to “work” miracles (Deuteronomy 34:11), to “make” money in the colloquial English sense (Deuteronomy 8:17), to “make” a name for oneself (Genesis 11:4), to “make” dinner or a meal (Judges 6:19), to “make” peace (Isaiah 27:5), to “work” a job (Ruth 2:19), and many other possible nuances. In short, many of the same meanings we can assign to the English verbs “make,” “do,” “work,” “perform,” “act,” and the like can also be ascribed to the Hebrew ‘āsāh. The word ‘āsāh basically has to do with producing something through work, and it may or may not imply pre-existing material. Passages echoing Genesis 1:1 routinely use ‘āsāh instead of bārā’ (e.g., 1 Chronicles 16:26; Nehemiah 9:6; Psalm 33:6; Isaiah 45:12). This fact implies that, while these two terms can be used interchangeably of Creation, one emphasizes the production of a new thing (whether at Creation or afterward), and the other refers to the work involved in producing a thing (whether at Creation or afterward). The Creation is one of the most commonly discussed biblical accounts in later biblical literature. The poetry of the Old Testament, particularly in the Psalms and Isaiah 40-55, is rich in Creation terminology. God has a claim on the lives of his people (and on the world!) becauseHe is the Creator of everything. It thus makes sense that the Hebrew language would feature many terms to express one of its most basic theological principles. The biblical terms for Creation are represented in the chart above. As one can observe, the terminology of Creation in the Bible is rich and varied. Many of these terms are used in parallel to one another, indicating their synonymous nature insofar as Creation is concerned. These terms also illustrate that the Israelites viewed God’s Creation holistically. God “brought creation into initial existence.” God “formed creation.” God “begat” Creation (in a figurative sense). God “established,” “founded,” “acquired,” “spread out,” and “made” every created thing. The full lexicon of Hebrew manufacturing is applied to Creation to illustrate that, in a single period of time, God set the world into existence, just as in a single moment He will destroy it (2 Peter 3:10). We previously mentioned that Gap theorists cite three grammatical Hebrew features in favor of their position. They claim: (1) the Hebrew waw implies a gap in the narrative; (2) the verb form “was” (hāyetāh)signals a new beginning; and (3) the nouns tōhū vā-vōhū imply a re-creation from a degraded, earlier Creation. We shall treat each of these arguments in order. First, the Hebrew letter waw, represented by the incessant “and” in the King James Version and often left untranslated in more recent versions, is always prefixed to Hebrew words. When it is attached to a shortened “imperfect” verb form in biblical narrative, it normally functions as a preterite (from Latin praeter, “before”). The purpose is to relate action, typically in the past, and the waw functions to connect those past actions to one another. When the waw is attached to a noun, as it is in Genesis 1:2, it is disjunctive, and thus signals a shift in the narrative. This shift does not necessarily imply a different series of events, much less events separated by billions of years in time. An abrupt shift is found in Genesis 3:1—“Now, as for the serpent, he was more crafty.” Although no serpent has been discussed, and the context determines a complete break in the narrative, there is nothing stated about the amount of time that elapsed from the creation of woman and the appearance of the serpent. Sometimes, however, the disjunctive waw can simply provide background information for the story being related (e.g., Genesis 13:13), or explain what is happening simultaneous with the narrative, but elsewhere in location (e.g., Genesis 37:36, translated well as “meanwhile” in the ESV). In these cases, the waw sets up a parenthetical remark which functions to explain the preceding information. This is, I believe, what we have in Genesis 1:2. Remember that Genesis 1:1 is a declarative statement: “In the beginning, God created the heavens and the earth.” Since the narrative will not focus on the creation of the heavens, but on the Earth, the next verse opens with the final word from the previous one (vehā’ārets). By utilizing the disjunctive waw along with the noun “Earth,” the Hebrew serves to focus attention on the creation of the Earth: “Now, as for the earth, it was formless and void.” This statement is clearly based on the final word of the previous verse as the narrative unpacks exactly how the creation of the Earth took place. The second linguistic argument from Genesis 1:2 deals with the term hāyetāh, traditionally translated “was.” Gap theorists insist the term means “became” or “had become.” They assert the bārā’ stage of Creation “became” or “had become” a desolate waste, and thus a re-creation (the ‘āsāh stage) was necessary. In the assessment of Fields, “It is the mistranslation of this word which has, perhaps, added more to the ranks of gap theorists than any one factor” (1976, p. 88). First of all, let us acknowledge that Gap theorists are correct about the Hebrew verb hāyāh. It can mean “became” or “had become.” But the meaning of any word must be determined by its context, and not by the translator’s arbitrary choosing of a meaning from a lexical list. In Genesis 1:2, the copular usage of the verb hāyāh in biblical Hebrew must be understood. The community of Hebrew grammarians is uniform in recognizing that the term hāyetāh (a feminine form of hāyāh) in Genesis 1:2 functions as a copula (see, e.g., Joüon and Muraoka, 2006, §154m), and thus simply links the subject with the object without implying any true verbal quality. Let us explain. It is recognized universally that “the Hebrew verb translated was refers to the time when God began his work of creation. Was does not mean that the earth remained in this shapeless state for a long time; nor does it mean that it became such after being something else earlier” (Reyburn and Fry, 1997, p. 30). This point is recognized in virtually every decent translation of the Hebrew text since the Septuagint (cf. the Latin Vulgate and the mountain of English translations). Gap theorists must find a different justification for their theory. The two Hebrew nouns tōhū and bōhū are so closely linked that Hebraists universally regard them as a hendiadys (even the Masoretic accentuation suggests this). Some English translations follow this understanding, using an adjective-noun construction (e.g., the NAB: “formless wasteland”). Traditionally, however, two adjectives are used to translate tōhū vā-vōhū. The Septuagint has “invisible and unconstructed” (aoratos kai akataskeuastos). The Vulgate understands the terms by the synonyms, “empty and void” (inanis et vacua). English translations have generally opted for “formless and void.” All of these are legitimate potential translations of a difficult Hebrew expression. By contrast, Gap theorists assert these terms imply a depreciation of the original Creation (e.g., Isaiah 34:11; Jeremiah 4:23). Since prophetic passages convey a change from order to disorder when the terms are used, Gap theorists believe the same meaning must hold in Genesis 1:2. [NOTE: Their interpretation here is contingent upon this erroneous understanding of hāyetāh.] However, the prophetic pronouncement is intended to be shocking. 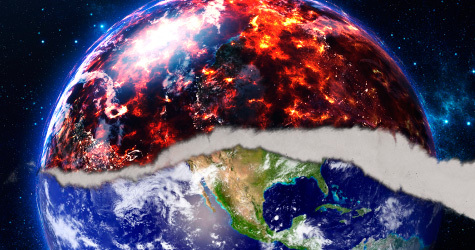 God plans to punish his people by dramatically reducing the land to a state of non-existence. It is not merely that He wishes to degrade their existence; He wishes to nullify it! One verse helps us to establish the appropriate meaning of tōhū in a Creation context: “For thus says Yahweh, who created [bārā’] the heavens—he is God—who formed [yātsar] the earth, and he made it [‘āsāh], he established [kūn] it not to be empty [tōhū]. He created it [bārā’] to be inhabited. I am Yahweh, and there is no other” (Isaiah 45:18). This verse not only utilizes the term tōhū in reference to what the Earth was not intended to be, but also associates the bārā’ Creation with the inhabiting of the Earth. While the Gap theorists are correct to understand tōhū vā-vōhū to mean a state of creation God did not regard as ideal, nothing in the Hebrew words themselves implies a depreciation of Creation. Rather, the expression conveys the amorphous nature of the Earth before God provided His creative structure to it. Such is the way the terms have been understood throughout the history of Bible translation. There is nothing in the Hebrew text of Genesis 1 to demand a gap of time. The Hebrews in fact had a variety of ways to express chronological gaps, whether general or specific. For general amounts of time they could and often did say, “after this” (acharēy-kēn) or “after these things” (acharēy-haddevarîm hā-’ēleh). To express a greater extent of time, they could have said “many days” (yāmîm rābbîm) or something similar. Although common in the Bible, none of these phrases occurs in Genesis 1. So we are left to trust the Gap theorists that they are qualified to speak where the Bible is silent, and to understand in the Hebrew what no Hebrew scholars actually affirm, and what no qualified translators have ever put forth. So is Gap Theory linguistically viable? No. Clayton, John N. (2011), The Source: Eternal Design or Infinite Accident? (Niles, MI: Clayton). Clayton, John N. (2015), The Rational God: Does God Make Sense? (Niles, MI: Clayton). Dorsey, David A. (1999), The Literary Structure of the Old Testament: A Commentary on Genesis–Malachi (Grand Rapids, MI: Baker). Fields, Weston W. (1976 reprint), Unformed and Unfilled: A Critique of the Gap Theory (Green Forrest, AR: Master Books). Joüon, Paul and Takamitsu Muraoka (2006), A Grammar of Biblical Hebrew (Roma: Pontifical Biblical Institute). Pember, Georg H. (1907), Earth’s Earliest Ages (London: Hodder and Stoughton), reprint. Platinga, Alvin (2001), “Evolution, Neutrality, and Antecedent Probability: A Reply to McMullin and Van Till,” in Intelligent Design Creationism and Its Critics: Philosophical, Theological and Scientific Perspectives, ed. Robert T. Pennock (Cambridge: MIT Press). Reyburn, William D. and Euan McG. Fry (1997), A Handbook on Genesis (New York: United Bible Society). 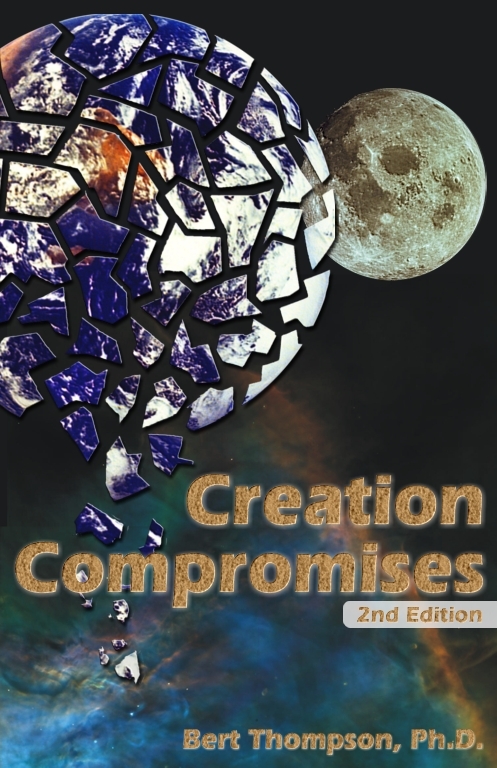 Thompson, Bert (2000), Creation Compromises (Montgomery, AL: Apologetics Press, second edition).